Are you citing more than one page from a website? Note: To find a stable URL for a Google map, use the Share icon, located between the send to mobile and print icons (see the example above). On the sharing page, select the option for shortened URL. For more information on how to cite Google Maps, see the APA Style Blog: How to cite online maps . Note: Webpages such as Wikipedia are frequently edited. You need to include the date you retrieved the information, just in case the information on the page changes at a later date! You may need to look around at a website a bit to discover all of the pieces of information needed to properly cite a page. Here is a sample website with citation details identified. Simcoe Muskoka District Health Unit. (2014). Cost of healthy eating. 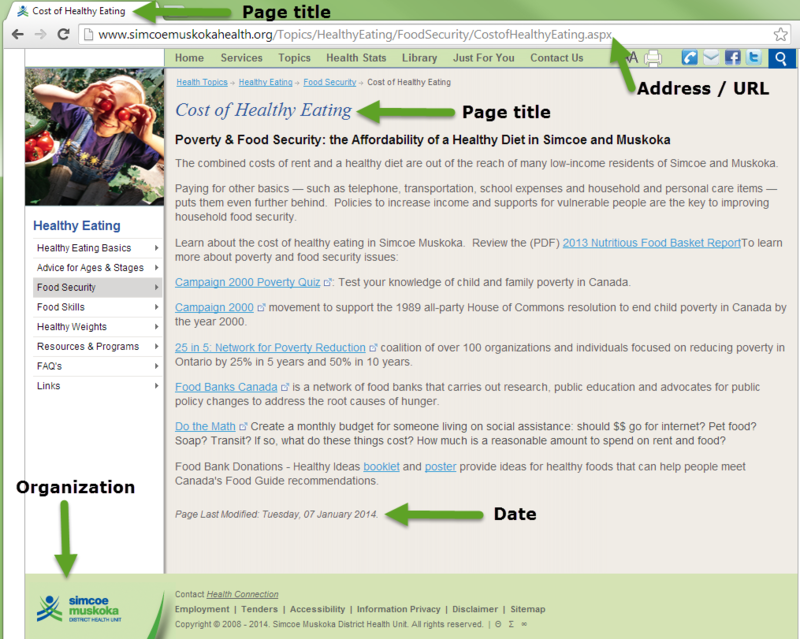 Retrieved from http://www.simcoemuskokahealth.org/Topics/HealthyEating/FoodSecurity/CostofHealthyEating.aspx .